Flareon in game: 643 Who? Important notice! Pokemon Flareon is a fictional character of humans. Flareon (Japanese: ブースター Booster) is a Fire-type Pokémon introduced in Generation I. It evolves from Eevee when exposed to a Fire Stone. It is one of Eevee's final forms, the others being Vaporeon, Jolteon, Espeon, Umbreon, Leafeon, Glaceon, and Sylveon. Flareon is a mammalian, quadruped Pokémon covered in short, reddish-orange fur. It has long ears, dark eyes, and a small black nose. There are three small toes and a yellow paw pad on each foot. 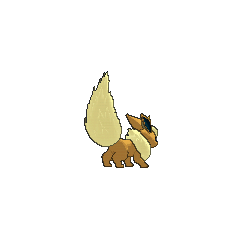 Fluffy yellow fur forms a small tuft on its head, as well as its bushy tail and a mane around its chest and neck. It will fluff out its collar to cool down its high body temperature. This high temperature is caused by its internal flame sac. Flareon stores and heats inhaled air in this sac, and then exhales it as fire. 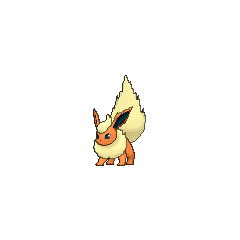 Flareon is mostly found in populated areas, and is rarely seen in the wilderness. Flareon first appeared in The Battling Eevee Brothers, under the ownership of Pyro. Ash battled against a Flareon in the Pokémon League Entrance Exam in The Ultimate Test. Flareon was seen under the ownership of the Kimono Sisters in Trouble's Brewing and Espeon, Not Included. A Fire-type Pokémon Trainer named Egan used one to capture a Magcargo in Some Like it Hot. Savannah has a Flareon which first appeared in A Fan with a Plan. It was used in the first round of the Rubello Town Pokémon Contest in Cruisin' for a Losin'. A Flareon belonging to Ursula appeared in Last Call — First Round! where it evolved from Eevee during the Performance Stage of the Sinnoh Grand Festival. It also appeared in Opposites Interact!, where it was used along with Gabite in a two-on-two Contest Battle against Dawn's Pachirisu and Mamoswine. 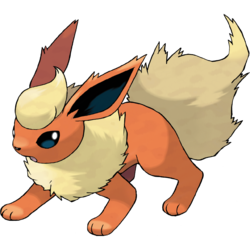 A Flareon appeared in Team Eevee and the Pokémon Rescue Squad!, along with an Eevee and its other evolutions, under the ownership of Virgil. A Flareon appeared in Mystery on a Deserted Island!, which it evolved from one of three Eevee. A Flareon appeared in Eevee & Friends with an Eevee and its other evolutions, including the newly introduced Sylveon. A Trainer's Flareon appeared in Bad to the Bone. A Flareon was among the Pokémon controlled by Cassidy and Butch in Pikachu Re-Volts. A Flareon was part of an exhibition in Flower Power. A Flareon appeared in Gary's explanation in Johto Photo Finish. Flareon made a small cameo in the beginning of Giratina and the Sky Warrior together with an Eevee and its other evolutions. A Flareon appeared in Old Rivals, New Tricks! under the ownership of a Pokémon Coordinator competing in the Sandalstraw Town Pokémon Contest. A Flareon appeared in an image/neon in A Showcase Debut!. A Flareon appeared in a video in Performing with Fiery Charm!, under the ownership of a Pokémon Performer. A Flareon appeared in a fantasy in Tag Team Battle Inspiration! where Shauna imagined what Serena's Eevee could evolve into. A Flareon appeared in Love Strikes! Eevee, Yikes!. AG077 Flareon May's Pokédex Flareon, the Flame Pokémon. Flareon is the evolved form of Eevee. The air it inhales is ignited by a flame in its body and expelled as fire. DP174 Flareon Dawn's Pokédex Flareon, the Flame Pokémon, and an evolved form of Eevee. It stores some of the air it breathes in its internal flame sac, which heats its body to over three thousand degrees. BW102 Flareon Ash's Pokédex Flareon, the Flame Pokémon. Flareon's internal flame ignites its breath, which is exhaled as fire. 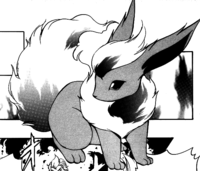 In Blame it on Eevee, a mutated Eevee could switch between his evolved forms, one of which is a Flareon. Red catches him and adds him to his team and names him Vee. Later using the Fire, Water and Thunder stones of Vermilion Harbor, which were given to him by Giovanni, to evolve and devolve him freely and faster. Eventually, he lost the ability to devolve after permanently becoming an Espeon, but Red felt more content now that he'd been freed from the pain that Team Rocket's experiments had dealt. A Flaereon appeared in a fantasy of Yellow's about Pokémon that could evolve via stone, it appeared with an Eevee, Vaporeon and Jolteon in The Kindest Tentacruel. The Electric Tale of Pikachu ET06 Evolved with the Fire Stone. Its body contains flame glands. When storing thermal energy in its body, its temperature could soar to over 1600 degrees. It has a flame chamber inside its body. It inhales, then blows out fire that is over 3,000F degrees. Its fiery breath reaches close to 3,000 degrees. Its body temperature exceeds 1,650 degrees when storing fire inside. It stores some of the air it inhales in its internal flame pouch, which heats it to over 3,000 degrees. It fluffs out its fur collar to cool down its body temperature, which can reach 1,650 degrees. Once it has stored up enough heat, this Pokémon's body temperature can reach up to 1700 degrees. 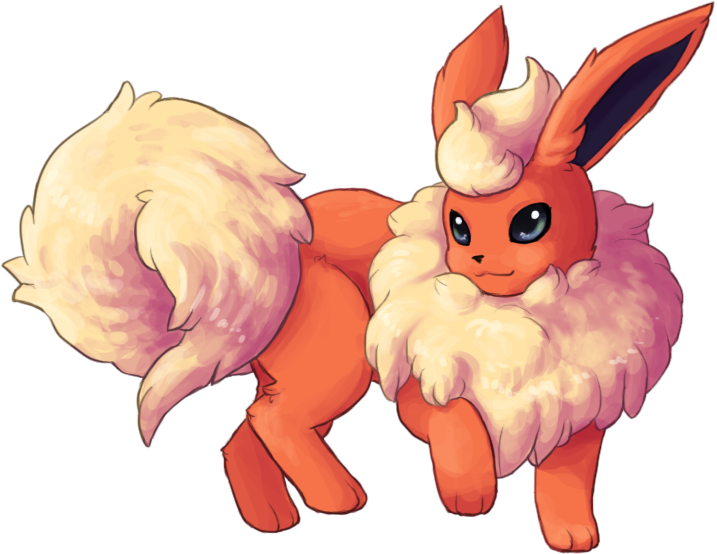 Flareon's fluffy fur has a functional purpose - it releases heat into the air so that its body does not get excessively hot. 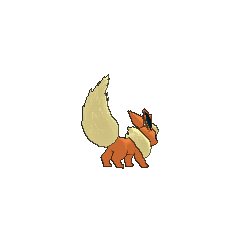 This Pokémon's body temperature can rise to a maximum of 1,650 degrees F.
Flareon's fluffy fur releases heat into the air so that its body does not get excessively hot. Its body temperature can rise to a maximum of 1,650 degrees F.
It has a flame bag inside its body. After inhaling deeply, it blows out flames of nearly 3,100 degrees Fahrenheit. When storing thermal energy in its body, its temperature can soar to over 1,600 degrees Fahrenheit. Inhaled air is heated in the flame sac in its body to an intense fire over 3,000 degrees Fahrenheit. It fluffs out its fur collar to cool down its body temperature, which can reach 1,650 degrees Fahrenheit. Inhaled air is carried to its flame sac, heated, and exhaled as fire that reaches over 3,000 degrees F.
It has a flame bag inside its body. After inhaling deeply, it blows out flames of nearly 3,000 degrees Fahrenheit. When it catches prey or finds berries, it breathes fire on them until they're well done, and then it gobbles them up. Its average body temperature is between 1,300 and 1,500 degrees Fahrenheit. In its internal flame sac, temperatures reach 3,000 degrees. This Pokémon's Special base stat in Generation I was 110. Moves marked with a superscript game abbreviation can only be bred onto Flareon in that game. 51%-100% HP I breathe 3,000-degree flames! 26%-50% HP My HP is halfway down. Level up I leveled up! My fire burns even hotter! Flareon is a key to the Fiore Temple's mystery. It attacks with its fiery breath. It attacks by spitting fireballs and breathing streams of fire. Flareon plays in the Lava Zone. The Attraction he specializes in is Rhyperior's Bumper Burn. He likes to run, but he also likes to think of a course to run. He wants everyone to run the racecourse he started. For other sprites and images, please see Flareon images on the Bulbagarden Archives. Flareon shares its category name with Charmeleon, Charizard, Moltres, and Infernape. They are all known as the Flame Pokémon. It is most likely based on foxes, due to its body shape and orange coloration, but it also has traits of felines. The fluffy mane and tail resemble a Pomeranian dog, as well as a lion's mane. Flareon is a combination of flare and eon (an immeasurably long period of time, possibly referring to how long evolution takes naturally). Eon is a suffix all Eevee evolutionsshare and was Eevee's English prototype name. Booster is literally booster, possibly referring to rocket boosters, which propel things by combustion of fuel. French Pyroli From pyro. Ends with -li like every Eeveelution in French. German Flamara From Flamme. Ends with -a like every Eeveelution in German.